Kaba’s E-Plex 3000 Series electronic push button keyless door lock is designed for narrow-style aluminum glass doors. It has 300 access codes and a 9,000-event audit trail that can also record key override usage. 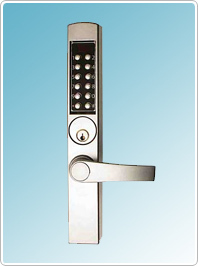 The keyless lock can be programmed at the keypad or with optional Microsoft Excel-based software. The battery pack, consisting of four AA batteries, is located in the tamper-proof base of the lock housing and provides 180,000 cycles. Narrow Stile lock for aluminum door frame of glass door installation – perfect for store front doors that require narrow keyless door locks.